Yemenwed was founded in 2006, in New York City, and currently includes: Megha Barnabas (writing, choreography), Timothy Dewit (music), Joseph Fraoli (sound design), Melissa Ip (costuming, choreography), Paul Kopkau (sculpture), Shawn Maximo (sculpture, stage design), Gloria Maximo (concept design, choreography, writing), and Jonathan Turner (video direction, animation). Yemenwed closely examines abstract visual patterns and narratives that emerge from day-to-day contemporary life. Through choreographed movement the shapes and tones of mundane domestic gestures are located and highlighted. 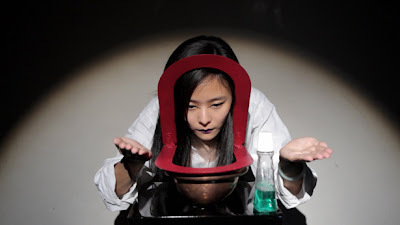 The performers’ bodily arrangements with various domestic objects and their surrounding interior and exterior spaces are outlined and questioned. The domestic scene becomes a theatrical stage where sculptural objects and performers play equal roles and mechanized dance movements replace the conventions of dialogue and plot. Performances place emphasis on the division between performer and audience.